EDIUS is video editing software that was developed in Japan. Since version 1 was released in 2003, we have aggressively upgraded it numerous times, and it is now used in many video production facilities. The strengths of EDIUS include its incredible nimbleness and flexibility. With a focus on multiformat real-time mixed editing at full resolution and frame rate, we have realized a speedy workflow and expressiveness through diverse effects. Moreover, even higher performance can be realized and unique environments for individual users can be created when used in combination with hardware developed by our company. From personal projects to editing movies for theatrical release that require high quality, EDIUS will continue to develop along with new video creation possibilities in the future. A variety of video sources have come into use. These include full high-definition video that can be easily captured with digital cameras, smartphones or other portable devices, and UHD video from 4K video cameras, which have begun to increase in availability even for consumer use, as well as 4K, 2K, 3D and 10-bit recordings for professional video. We have optimized the EDIUS engine, which we developed ourselves, for Intel Core i processors in order to edit video sources including 4K, which has become the standard for the next generation of video. EDIUS provides a comfortable real-time editing environment for native data (video files as recorded) without requiring conversion to intermediate codecs for editing work. 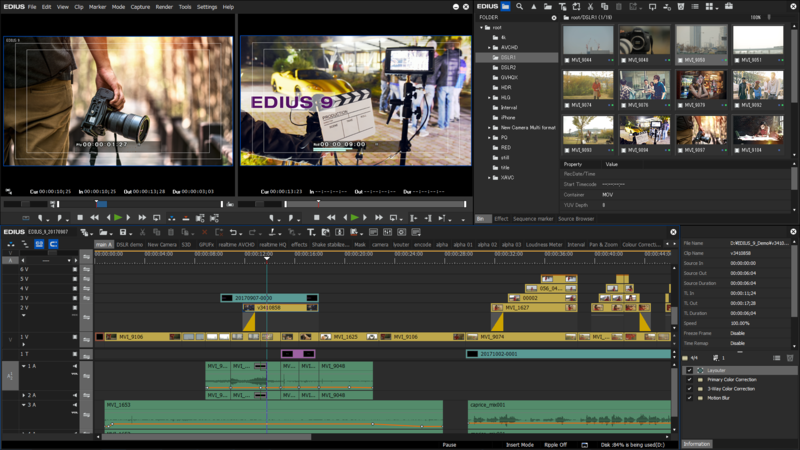 EDIUS can support every kind of work environment according to its production flow, including news that must be edited in short amounts of time, film that requires high-quality video production and post-production of commercials. EDIUS supports the intense workflows of the next generation of professional video production workplaces and can be used to build satisfying video production environments. All EDIUS development is conducted in Japan. Sony, Panasonic, Canon, Nikon, JVC Kenwood and other Japanese manufacturers hold significant shares of the video camera market for both consumer and professional products. Taking advantage of undertaking development in Japan, we work in close cooperation with these camera makers from the development stage so that we can include new codecs as quickly as possible in EDIUS. As a result, we are able to support a wide range of products from consumer devices to professional video and cinema cameras in a timely manner in EDIUS. We are also able to support numerous log color spaces utilized in HDR editing. Of course, loading native formats without conversion to intermediary codecs and quick, stress-free editing are also possible. Since its first version, EDIUS has taken the lead in supporting mixed editing of multiple formats. Even with multi-camera editing that allows switching of up to 16 cameras, you can continue editing in native formats with multiple codecs on the same timeline. Taking advantage of being a 64-bit native application, EDIUS can use large amounts of memory in excess of 4GB and set vertical and horizontal aspect ratios freely. Not restricted to TV, film and other common frame sizes, EDIUS also supports editing of long and wide video images that are used for digital signage and event videos. From 24×24 pixels to 4K×2K, videos of different sizes can be mixed on the same timeline and processed in real time. Monitoring can also be adapted to the resolution of the monitor display and set to show everything. This allows it to provide an editing workflow unrestricted by resolution, endowing it with flexibility that enables support of all types of video production. The marquee feature of EDIUS is real-time editing that maximizes use of CPU power and is superior to competitor offerings. EDIUS has been further optimized for the latest CPU architectures, represented by the Intel Core i processors. In addition to the distributed processing of multiple decoding processes, it takes full advantage of Intel Quick Sync Video hardware acceleration. Products made by other companies only use this acceleration during encoding. EDIUS, however, also uses it when decoding during playback, so even when working on compact computers and laptops that lack sufficient processing power, native editing of, for example, highly-compressed 4K 30p/24p H.264 files is possible. Moreover, since CPU extensions (AVX2 and FMA3) are supported, the high processing speed required for demanding video editing work is achieved to the greatest extent possible. Since decoding is always conducted at full resolution and frame rate, rendering is not necessary for previewing and high-quality editing conditions are maintained constantly. Support is possible for a great variety of video production styles. Basic functions that enable diverse “horizontal editing” styles that follow timelines include not only a variety of trim modes, JKL playback, and 3-point and 4-point editing, but also a ripple function that automatically moves other clips forward after clip trimming and deletion, multiple clip grouping and separate editing of video and audio. In addition, customizable button and keyboard shortcuts and intuitive mouse actions also contribute to outstanding ease-of-use. Moreover, EDIUS offers outstanding expressive possibilities through numerous video effects with high real-time performance, including 10-bit color correction for advanced control of video colors, and masks and layouters that support key frames. Furthermore, we have anticipated all kinds of work environments and included numerous functions that increase editing work efficiency. For example, even with formats that use complicated folder structures, materials can be imported smoothly using a source browser linked with the Mync content management application. Other features include nest sequence functions, background processing, a proxy editing mode, and creation of 4K editing workflows utilizing the Grass Valley HQX codec. EDIUS enables advanced color grading and color correction, but it also provides compatibility with tools that editors might be accustomed to using. Using AAF files, EDIUS can be the bridge in a variety of situations and fulfill its key roles. For example, workflows can incorporate Blackmagic Design’s DaVinci Resolve and Avid Pro Tools, which is used as an MA environment. Furthermore, numerous plug-ins, including titlers and high-quality chromakeys, made by other companies are available. Utilization of these plug-ins further raises the potential for creativity. In addition to using Grass Valley I/O hardware for input and output, third-party hardware can be used for output up to 4K 30p. With EDIUS, you can use hardware made by Blackmagic Design and AJA Video Systems. The included Mync content management application can load a variety of videos and allows easy previewing. Linked with the EDIUS source browser, in addition to classification, rapid smart searching and uploading are possible. By using Mync and Intel Quick Sync Video to their full extent, this one package can handle everything from the management of materials to high-speed encoding. DVD and Blu-ray Disc authoring functions have been included in previous versions. They can now encode even more quickly and use of a resampling method for processing enables the creation of high-resolution DVDs. Export functions for edited videos are also extensive. With abundant presets for file formats ranging from web video to professional applications, selection of file formats will cause no confusion. Moreover, you can use our software with peace of mind because we do not use a subscription model that incurs monthly payments like other companies do for their software. With EDIUS, we have always aggressively provided numerous free updates, implemented support for new camera formats and enhanced functions for outstanding creativity. We expect the video industry to continue developing in the future, and we intend to add appealing new features for free while assuring work efficiency and stability. We hope you will look forward to these advances with us.